1932 Massachusetts INSPECTION sticker - $20.00 : Bob Hoyts Classic Inspection Stickers, Add a Final Touch to your Restoration! 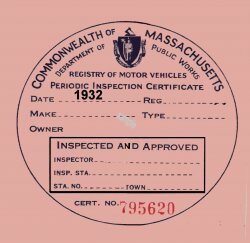 This 1932 Massachusetts Inspection sticker was restored and reproduced both front and back, identical to the original. It can be ordered with your own Car license number on the front along with your own choice of inspector and station number for an additional $10.00. NOTE: In 1932 Massachusetts did not issue license plates. Instead it issued a registration sticker. If you want your car to be historically correct you need yo go to our 1932 Registration site. This has our patented "peel and stick" format which allows attaching this sticker to the inside windshield lower passenger side next to the Registration sticker.